Air is indeed the "New Oil". 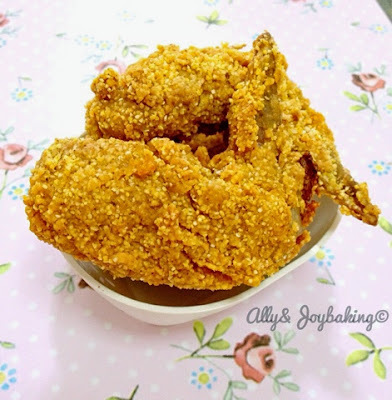 Remember my previous Crispy Baked Chicken post? The Air Fried Even Crispier Chicken Drumsticks elevates this to a totally new level. Imagine this, this guilt-free (almost) Crispy "Fried" Chicken is so crispy (Yes, I mentioned Crispy twice in the same sentence) that you will be wanting to eat this EVERYDAY. It is really thaaat good. If you love the KFC Hot & Spicy Chicken, the Crispy Baked Chicken is better and this Air Fried Even Crispier Chicken Drumsticks is better-er. LOL! 3. I used barely one teaspoon of oil for 4 pieces of drumsticks or chicken leg. • Rapid Air Technology that enables you to fry, bake, roast and grill, the tastiest snacks and meals with up to 80%* less fat than a conventional fryer, by using little or no oil! I was impressed by how intense the flavor of the spices was after being air fried and the skin was crackling when you bite into it. Although the skin is relatively greaseless, the meat inside is so juicy and tender. OMG, I want to make some for you just to proof my point. The recipe is here. (I omitted the melted butter). Only the instruction for the cooking time is different. 1. Preheat the Air Fryer to 200°C. 2. Then, put in the drumsticks onto the mesh wire tray and air fry for 10 minutes at 200°C. 3. Pause at 10 minutes, brush some oil onto the drumsticks. (Flip the drumsticks to apply oil on the other side) Updated on 7/10: If you are making chicken thighs, go easy on the oil as thighs has a higher fat content than drumsticks. So, after the first 10 minutes, just brush the oil over the white spots of flour sparingly and you do not need to flip the thighs. I brushed oil on both sides and ended up with the bottom part "wet" from the oil that is dripping out. It is still very OMG juicy, but if you prefer a dry and crispy batter throughout, skip the oil on the bottom part and no flipping required. 4. Lower the temperature to 150°C for another 10 minutes to ensure the drumsticks cook through. (You will see the liquid runs clear or use a fork to poke through the mean to test the doneness). Thanks for this recipe - I have made it a few times now and each time they have been absolutely cracking! Hi 41South! They are delicious aren't they? I love them too. :) thanks for dropping by! Hello! May i know if there is a need to spray oil on the chicken before air-frying? very nice review! Oh my goodness! I'm really starting to love this product! Baba ganoush in minutes - that's great. I wonder what other gorgeous recipes are in the cookbook... It'd be great to try a few of them! thank's for tips & sharing. Hi Intan, I would cut down the time as fillet would cook faster indeed. Perhaps, you can cut down the time to 7 minutes at 200C and 7 minutes at 150C. Should you prefer a drier exterior after that, just AF for another 3-5 minutes at 180C. After the first 7 minutes, look at the fillet, if it's very "floury", I would suggest you to spray some oil on. :) Happy trying and let me know how it goes!